Sometimes granola gets a bad rap- everyone loves it, but then there's the thing about it having "soooo many calories." Sure, if calorie counting and pre-packaged, mass-produced granola is what you're used to then you're probably right. But the beauty of cooking from scratch is not just that it's soul-feeding, it's that you have control over what to include in/ exclude from your food. This recipe bridges the gap between sweet and savory with flaky sea salt and natural sweeteners like coconut sugar and maple syrup. Floral notes in cardamom complement seasonal fruits at breakfast and sharp vinaigrettes at lunch. Be sure to toast the coconut separately, as it cooks much faster than the rest of the mixture and would definitely burn after 30 minutes. Feel free to swap out some of the seeds and nuts based on what you have on hand, but try to keep the total weight of the uncooked oat mixture to about 495g to keep a good ratio of wet to dry ingredients. Preheat oven to 350F degrees. 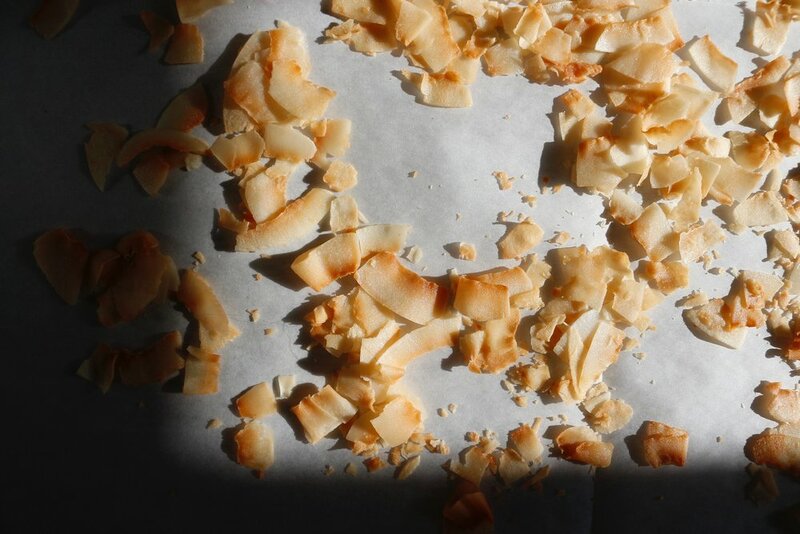 Place coconut flakes on a baking sheet lined with parchment paper and toast until perfectly golden brown and fragrant, about 6 minutes. Transfer toasted coconut to a small bowl and combine with hemp hearts and set aside. In a large bowl, combine oats, sliced almonds, sesame seeds, flax seeds, and chia seeds. In a small pot, combine almond butter, coconut oil, maple syrup, coconut sugar, and ground cardamom and heat over medium until the coconut oil is completely melted and well combined. Crush the sea salt between your fingers and stir into the warm almond butter mixture. Pour the almond butter mixture over the oat mixture and stir until everything is evenly coated. Transfer to the baking sheet and spread into an even layer, then season again with a big pinch of flaky sea salt, leaving the crystals larger this time. Bake for 30 minutes, tossing halfway through. After 30 minutes, remove from the oven and stir in the toasted coconut and hemp hearts until evenly incorporated. Allow granola to cool at room temperature before transferring to an airtight container. Serve with yogurt and fruit, your milk of choice, or sprinkle into salads for crunch.